Sorry been away for a few days, as this past weekend was quite tiring for me. Friday was the rehearsal dinner for my youngest son’s wedding and was an hour from our house one way. We made it through that okay and then Saturday was the big day. The venue was another hour away, plus we had to be there by 3 p.m. for pics and stayed until 10:30 p.m., so I was quite tired by the time the night was over. The wedding was beautiful, reception was great, and am waiting for my photo album so I can see all the memories. I ended up spending all day Sunday in bed recovering from the festivities. Monday I then had to run errands and such, so by the time I got home the last thing on my mind was posting to my blog. So, today I had my staples out and figured it was time to catch up. I have to say I am one of those who seems to heal a bit faster than scheduled, as the staples did not want to come out. I mean it really hurt, as there were 27 of them to pop out. I of course was in tears by the time she was done. She asked if I needed a breather, but told her we just need to get this done and keep going. 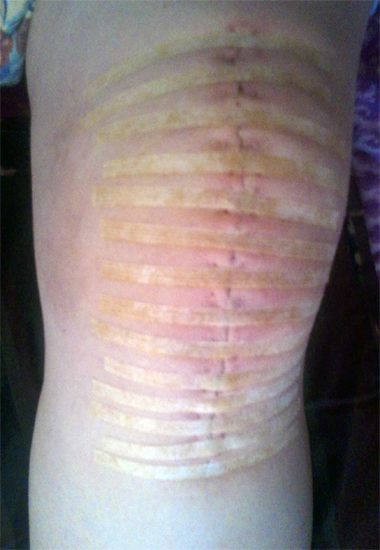 I now have these long strips on my knee, which to me look goofy, but I guess that makes sure I don’t split the scar open, which would be gross and an issue I am not in the mood to deal with. So, would I have the surgery again now that I am exactly 2 weeks out? Not sure yet. I am still having issues getting around, which the doctor said it would be months before I really feel good again, but even at this point I already find I have more stability than I have had in years. One thing I wish I had done before the surgery, which I would recommend to anyone looking at having this surgery is work on your upper body strength. I have very little strength in my arms and such and have found that when it comes to the point of needing to pull up or use the hand rails to help get myself up my arms are not much help, as there just isn’t the strength needed to pull. If I had it to do over again I would work on arm strengthening exercises so I would have more luck with pulling up and such. Just a suggestion, as I think I would have had more luck with certain things like getting off the toilet or getting in the shower if I had done that. Okay, I must admit in the hospital if it wasn’t for my wonderful green button I could push every 6 minutes I don’t think I could have handled the pain. It was great. I could watch it and the minute it lit up and was green I could push it and then nighty night. Oh, the pain was gone. Of course, they took that away after the first day and put me on IV morphine shots alternating with oral pills, which worked okay. I mean there were times where it felt like the staples were ripping out of the front of my knee, but there were some times in which I couldn’t care less what was going on. I mean the IV morphine it was a trip, literally. I would sit there and I guess I was crossing the line between dream state and real life and wasn’t understanding which was which. I would talk to someone in my dream and then talk to my husband about what I was talking to the imaginary person about. Of course, he was confused as could be with no idea what I was doing. I would then go back to talking to imaginary dude and my husband would just look at me like I was nuts. I also had the points where I would fall asleep in the middle of taking a drink of water and end up pouring the rest of the water on myself and waking up wondering why I was wet. I would also fall asleep in the middle of eating and drop the food on myself and other fun stuff like that. I also would talk to myself. I asked my roommate if I bothered her, and she said no, but she did say she would walk by and see me asleep with my arms straight up in the air wondering how I could sleep like that. What she didn’t know was I was having one of those falling dreams where you wake up with a jolt and wonder where you are and if you are okay. If you have seen the movie Inception, that is an easy explanation of the concept. I had a lot of those types of dreams while on morphine. Now that I am home I am on hydrocodone with a mix of Tylenol, which is more Tylenol than any of the good stuff, so I am actually making sense now and not acting so goofy. I am also in a bit more pain, but these are easier to wean off of. I was watching a show the other night on “Hillbilly heroine” which is Oxycontin. An alarming amount of people are becoming addicted to prescription pain pills because it is supposedly cheap and easier to get than the other stuff. I guess I don’t understand, if the high they are talking about is the state I was in while in the hospital, I really don’t see how that was much fun. I don’t like talking to people who aren’t there, pouring water on myself and making absolutely no sense. Maybe it is a control issue or I just don’t like acting the fool, but if that is the high they are so thrilled about they can keep it. I guess I have never been one to like anything that could cause me to lose control. I don’t drink, never used drugs and never smoked. Smoking really doesn’t count in this issue, but I just have not used any type of substance that would cause me to become addicted, well, other than food, but some would argue that you can’t be addicted to something you have to have to sustain your life. I am not sure about that, but that is for another post. Okay, this has been a bad day. I saw the nurse first thing this morning and she was saying my knee was looking good, so yea. 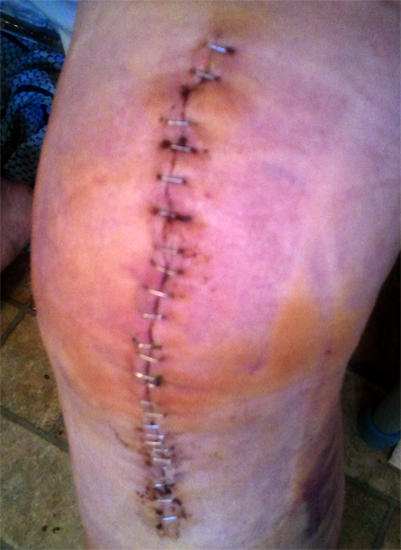 I get the staples out next Tuesday. Gene and I then decide I have got to go to one bank and go in and cash a check and then go eat something and finish up by going through the drive through at my bank then I get to go home. I end up getting out of the car and am able to get into the bank okay. At this point I am starting to sweat, but it is okay. I get in line and don’t have to wait too long, but then I get up to a teller who couldn’t have been any slower if she had been asked to be. I mean I am cashing a cashier’s check, what is the big deal. There I am with my walker, sweating like a pig starting to get really sick to my stomach and she decides she needs to talk to another teller. I am contemplating whether to tell the woman if she doesn’t hurry up I am going to upchuck on her counter or just stand there and pass out. The other customers are looking at me like I have something contagious or something. She finally decides to give me the money, never asks how I am doing and by that point I am just hoping to get to the car before I get sick. I made it okay and went on to Don Pablos to eat. They were great there, made sure the door was opened for me and sat me in an easy place to deal, so other than the fact I was too sick to eat, lunch was great. So, I finally get myself home from my ventures and decide to strap my leg into my CPM machine (continuous passive motion) that I have to use 8 hours per day to keep my leg flexible and work on the flexion in my knee. I am already in pain from earlier, this stupid CPM isn’t helping and then I get a call from my physical therapist that she can only see me today or Friday and no PT on Friday, as my son has his wedding Saturday with the rehearsal dinner Friday evening, so I agree. OMG, that was a dumb thing to do. She decides to push me through my normal exercises and then added some really hard ones on top of it. She was going to check how I was doing with my chair exercises, but when she checked my blood pressure and it was a bit elevated she said I better sit and rest and not worry about it. I still had 6.5 hours left on the CPM machine, which I am currently doing. My knee is all ready hot to the touch, but that is from the inflammation, which is normal. 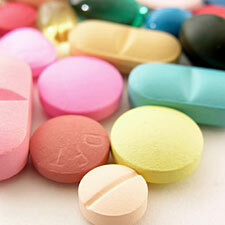 I just wish I didn’t have 2 more hours until I can take my pain pills, but that is okay, as I can take a Tylenol. I understand that I have to get up and moving, I need to go through physical therapy or the surgery would be for naught, but goodness, do they have to push it this hard. I guess so, or I will be one of those up at the ortho clinic after months of PT and still limping and can’t get around, which makes you wonder why a person would even go through this for there to be no change. I mean, I really do not enjoy being in pain. 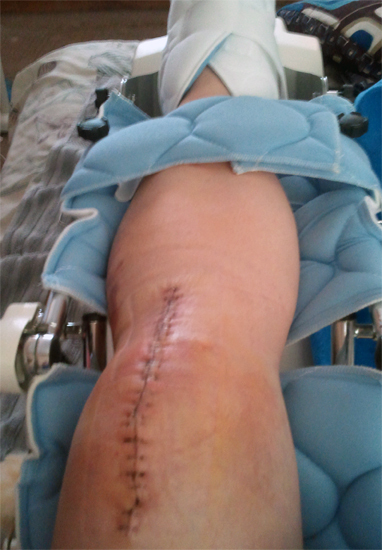 Well, we are now 8 days from surgery and think I am actually doing pretty good, just wish I didn’t have so far to go. Till next time…. 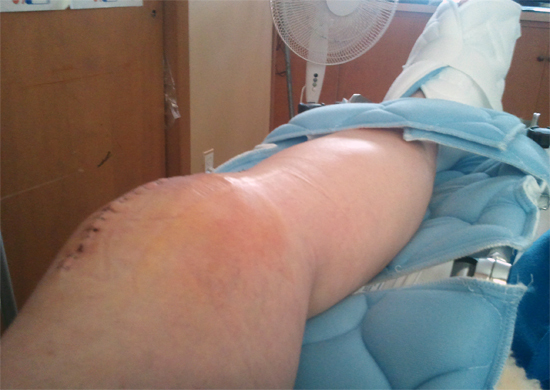 Today we continue on my journey after knee replacement surgery. I am learning the lesson that I am not “super woman” and I can’t do it all. Okay, I admit it, I like to be in control. I am very independent and normally hate to ask for help. I am one of those types that it is faster for me to do it than to explain it so get out of my way and leave me be. I am not rude about it, I just find it easier and it is part of that staying control thing I have. So, my first morning home I am sitting in the bathroom and decide I am going to take a shower. I haven’t washed my hair in a week and I am taking care of the situation. I did call my hubbie on my cell, but his phone was off, and then I tried calling my daughter’s phone, but she wasn’t answering. I then tried opening the bathroom door and yelling for some help, but no answer, as everyone was still asleep. 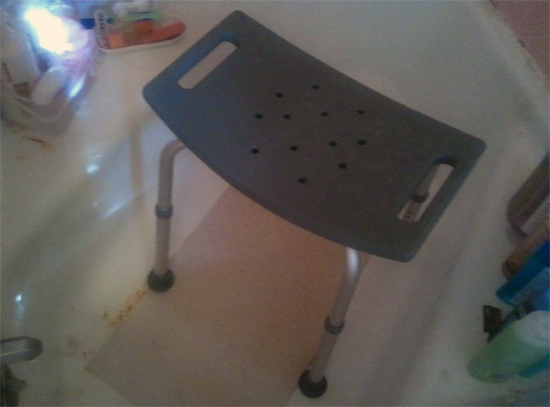 I am like okay, I can do this, I am going to get in this shower and sit on my shower chair and things will be great. Boy, was I wrong. I use my walker and get over to the shower and look into the shower and think about how I am going to work this out. I try lifting the bad leg, but no, tried putting full weight on the bad leg, ouch, tried pulling out the shower chair and putting my legs in the shower, yea right. So I finally decided to sit on the chair outside the shower, put towels around it, and just take a sponge bath and put my head under the running water so I could at least wash my hair. I am sitting there worn out, making a mess in the bathroom and crying and in walks hubbie asking what the heck I was doing. After explaining the situation we get my cleaned up, dressed and back to the bedroom where I decide to take a nap. Okay, what did I learn from this fun? Well, it is okay to ask for help. I am not invincible and there comes a time in life where it is okay to allow others to help you. It is also okay to use a makeshift bedside commode instead of stumbling all the way to the bathroom and then having an accident, and it is also okay to stop and ask someone to help you no matter what it is you need help with. There comes a point in all our lives that we have to set aside our pride or whatever you want to call it and say I need help and it is alright to ask for it. I must say my hubbie has really stepped up to the challenge and has been helping all he can even though his is physically disabled from his stroke several years ago. At times it is kind of the blind leading the blind, but we are making it work and that is all that matters. I do have to admit I am still dealing with trying to be open to help from others daily, but it is getting a bit easier. Till next time….